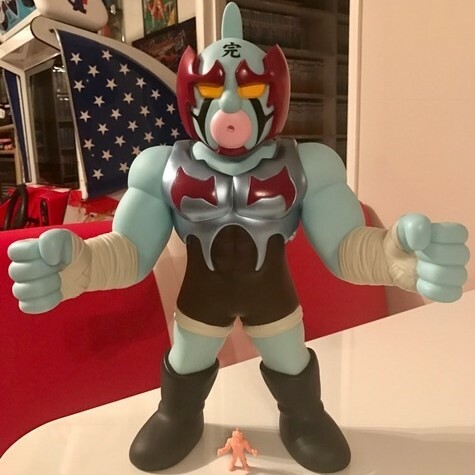 Here we go again with another wave of new Kinnikuman figures, this week I look into the 2 huge Kinnikuman figures released by Bandai. 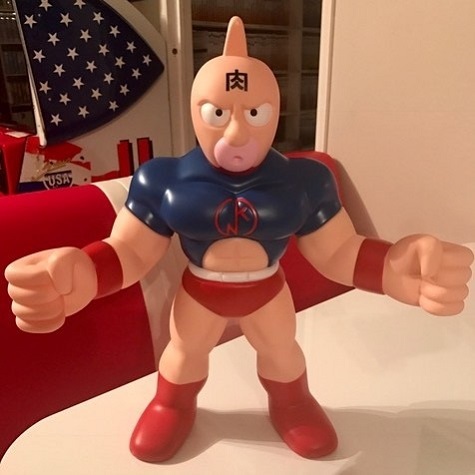 They are Kinnikuman and Nemisis. Again we get another Nemisis. If anyone can shed light on why he is popular I’d like to hear it. These figures are a massive 45cm tall – which is about 18 inches tall for you folks in the USA. 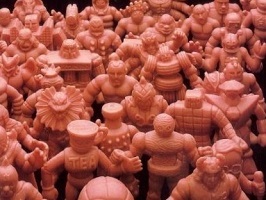 You can see in the Nemisis picture how big it is compared to a regular sized M.U.S.C.L.E. figure. It just simply towers over a regular figure. It’s so big in fact, I could only photograph it on my diner table in the mancave, apologies in advance for the poor quality of photo’s this week. These 2 figures have no articulation I’m afraid, are pretty much in the exact same pose as well and will set you back approx $120 US each. However, that’s probably the only negative thing I can say about these. The paint jobs are really nice and they feel nice and hefty. I do love large figures in my collection, it just looks impressive. There are a couple of minor differences between the 2 sculpts even though on first glance you may think it’s the same sculpt with a different paint job. I don’t know if my bank balance can absorb all these new Japanese releases but each time there is, I have that feeling of excitement of what they are going to produce next. I feel like that’s all the MMMM posts have been about lately so next week I will come back to M.U.S.C.L.E. and put my 2 cents in on all the large Class A auctions happening lately. Until next week. This entry was posted on Monday, February 12th, 2018 and is filed under UofM News. You can follow any responses to this entry through RSS 2.0. You can skip to the end and leave a response. Pinging is currently not allowed.